The matches between India and Pakistan are always exciting, not only for the folks of these countries but for the entire world. Whether it’s a cricket match, Hockey match, Tennis Match, etc. people show interest in all games between these two rival countries. 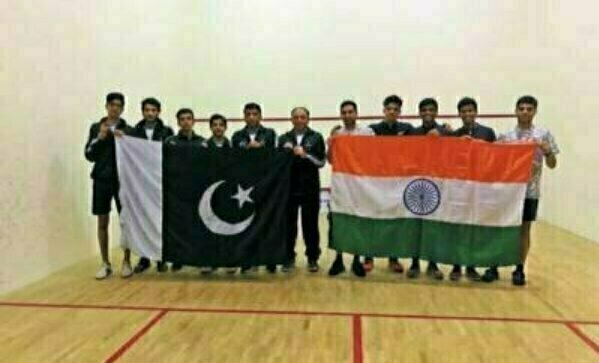 In the match between India and Pakistan in 19th Asian Junior Squash Championship, Pakistan win. The sensational and amazing performance by the Harris saved the day for Pakistan and earned a big victory by beating Pakistan’s traditional rival India. The match was held in Pattaya, the city of Thailand on Thursday, 17th January 2019. The game was exciting as both teams played well and worked hard to let their own countries win. Although Pakistan’s Squash team is well prepared, it was seemed to be under pressure while performing against India. But all credit goes to the Hero, Harris. He has surprised the world by giving a strong and amazing comeback after striking down with 0-2. Harris has defeated Chotrani, although Harris was suffering from Calf Muscle Injury. Abbas Zeb also played an important role by giving a good start. Abbas Zeb defeated Utkrash Behtei and Farhan Hashmi get defeated by Tushant Shuhani. If Pakistani Team keeps showing performances like this, then it is more likely that they will pass the semi-final too. The past of the Squash in Pakistan is not very brilliant. The main reason seems to be in the coaching sessions and hiring boys on merit. The federation has always claimed that they are providing top class and fully equipped training to the boys, but the overall practical performance of team tells us some other story. It is essential to hire highly qualified and intelligent coaches, who can give training to boys in real means. This is a must have a notable point for the Squash federation; otherwise, the Pakistani Squash will continue suffering from losses.